The LingPhil summer school is an annual event primarily for the training of Ph.D. students in linguistics and philosophy in Norway, but students from other countries can come as well. This year it was held at the Solstrand Hotel and Spa, near Bergen in Norway which is a beautiful old hotel built in 1896. The school opened on Monday June 4th with a session by Ewa Dąbrowska highlighting the “Seven Deadly Sins of Cognitive Linguistics”, which include excessive reliance on introspective evidence. The following day Paul Kerswill from the University of York spoke on sociolinguistics – demography, social structure and identity in language change. As case studies, he talked about contact varieties of English which grew up in the Industrial Revolution, and recent developments in London English. Languages which are in contact become simplified, while languages which are isolated grow more complex. 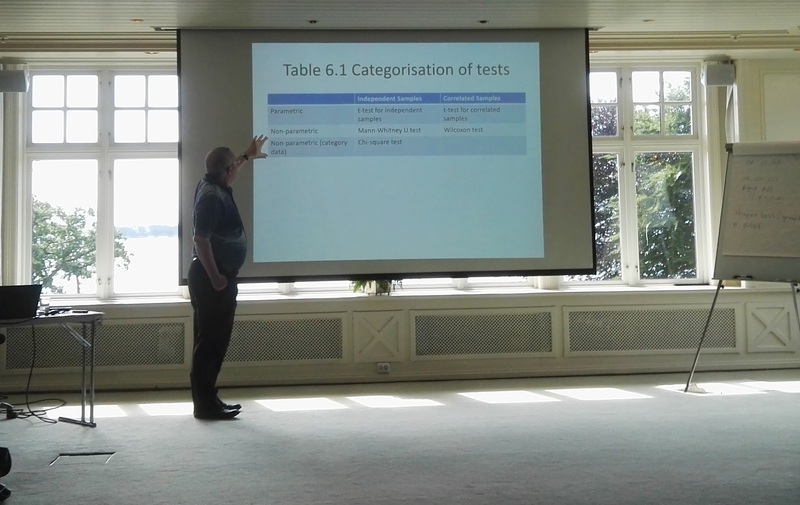 Steve Mann from Warwick University gave a training session on the research interview – how to collect data and analyse it, and the pros and cons of individual interviews and focus groups. Wednesday was eventful, starting with a session on Corpus Pragmatics. Our excursion was in the afternoon, a boat trip along the Bjørner Fjord to the island of Lysøen, which was once owned by Ole Bull, a world famous violinist. He had built an ornately carved wooden house there, with a main room that could be used as a small concert hall. One of the organisers, Gisle Andersen, came with his choir to sing songs composed by Ole Bull and Edvard Grieg. On the Thursday, I gave my sessions on “Statistics for Linguistics”, using Chris Butler’s book of the same name as the basis of the course. It was a busy day for me, as in the evening, I led a discussion group with students who are using statistics in their Ph.D. studies. Agnes Marie Bamford, who runs her own consultancy, and Claudia F. Hegrenæs from the Norwegian School of Economics, ran the career workshop. They pointed out that many transferrable skills can be gained from studying for a Ph.D., such as writing, networking, time management, analytic skills, critical thinking, problem solving, processing information quickly, endurance, grant writing skills, presentation skills, organising and coordinating, teaching experience even outside your comfort zone, and how to pitch your project. In fact, there was a special session devoted to the students all preparing “elevator pitches” to describe their work in two or three minutes. On the final day, Åsta Haukås from the University of Bergen gave a session on multilingualism, and strategies that people, who are already at least bilingual, use to learn new languages. Many of these had been discovered using questionnaires based on SILL, the Strategy Inventory of Language Learning. As an illustration, we were given an article about Juliette Binoche in Dutch, and guessed the origins of each word in the text. This entry was posted in Uncategorized on July 5, 2018 by riilp.